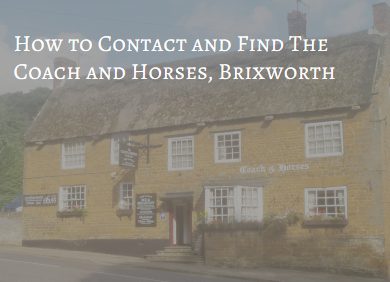 We are ideally located at the north end of the village of Brixworth - just off the A508 road from Northampton to Junction 2 of the A14 - about 10 minutes from the A14 and 20 minutes from Northampton. From Northampton, take the A508 out through Kingsthorpe towards Pitsford Reservoir. When you get to the roundabout with Pitsford Reservoir and Sailing Club to the right and Brixworth signposted to the left, go straight over. At the next roundabout (signposted Scaldwell and Old to the right and Brixworth to the left), go left into Brixworth. Follow the road round a sharp left-hand bend and the Coach and Horses is on your left-hand side. Note re Sat Nav: Please do not rely on entering the postcode into Sat Nav - it regularly takes people to the wrong location! Sunday - OPEN ALL DAY!